"The 1970 Rule" will be the key criterion for museums contemplating the acquisition of the antiquities. Was the object known prior to 1970? Is there a recorded history? 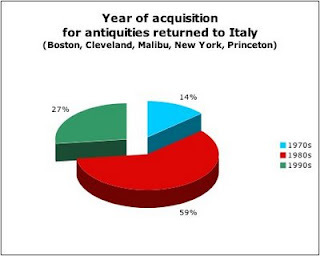 A study of the year of acquisition for the items (now numbering well over 100) returned to Italy from Boston's Museum of Fine Arts, the Cleveland Museum of Art, the J. Paul Getty Museum (Malibu), New York's Metropolitan Museum of Art, and the Princeton University Art Museum shows that 14% of the items were acquired in the 1970s (including the Euphronios krater). (This excludes the pieces returned from Shelby White, the Royal-Athena Galleries, and the University of Virginia Art Museum in Charlottesville). 27% of the returns were acquired in the 1990s, well after the USA signed up to the 1970 UNESCO Convention in 1983. Indeed more than 85% of the acquisitions were made in the 1980s and 1990s, after the 1973 Resolution of the Archaeological Institute of America. And it may make institutions such as the Michael C. Carlos Museum at Emory University rethink its collections management policy which hinges on the (now discredited) 1983 date.